Chicken Pot Pie Casserole Recipe — Pip and Ebby - easy, delicious recipes! Chicken Pot Pie transformed into a delicious casserole! Creamy vegetables and chicken baked into a buttery crispy crust that is comfort food perfection. This easy dinner goes together quickly and will become a family favorite! 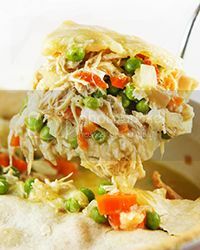 For two other very similar yet different recipes, check out my Slow Cooker Chicken Pot Pie and my Easy Chicken Pot Pie! Lately I have been chipping away at my to-make list of comfort foods. I've been wanting to make something along these lines for so long. It was super easy to make this Chicken Pot Pie Casserole. It is comforting, delicious and low calorie! Dan claimed it was the best Chicken Pot Pie he'd ever eaten. He rarely makes extreme statements, so that is a ringing endorsement! Making your own Chicken Pot Pie is a wonderful comfort food for dinner! Preheat oven to 350 degrees F. Coat a 2 ½-quart round baking dish with cooking spray and set aside. In a large skillet, heat the olive oil over medium heat. Add the carrots, peas, onions, salt and pepper. Cook, stirring occasionally, until veggies are soft and the onion is fragrant, 4 to 5 minutes. Add the chicken, chicken broth, soup, milk and flour (if using). Mix well and cook over medium-low heat for an additional 5 minutes. Pour the contents of the skillet into the prepared baking dish. Cover with the pie crust, letting the edges hang over the sides of the dish. Using a sharp knife, cut a few slits into the dough. Place baking dish on a baking sheet and bake in the preheated oven for 40 minutes, or until crust is lightly browned. Let cool for 10 minutes. Cut pizza-style and serve warm! Chicken Pot Pie transformed into a delicious casserole! Creamy vegetables and chicken baked into a buttery crispy crust that is comfort food perfection. Put together quickly, this is a family dinner favorite and needs to be added to your rotation!